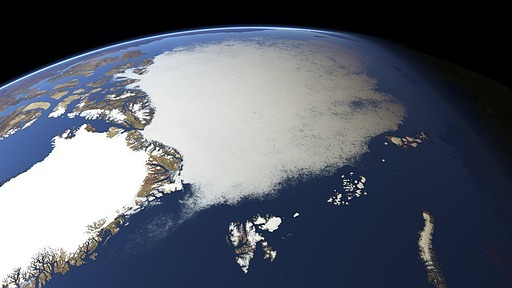 The Arctic Ocean covers the area around the North Pole. 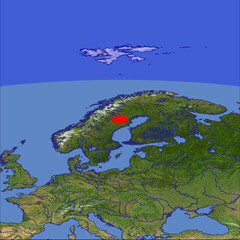 Parts of it are covered by ice all year round as illustrated in this view although the summer extent of the ice cover is shrinking. On the left side you can see Greenland with its ice sheet and behind the islands of the Canadian Arctic. Located in the foreground is Svalbard and to the right Franz Josef Land, Severnaya Zemlya and Novaya Zemlya. This image is licensed under the Creative Commons Attribution-Share Alike 3.0 license and is also available under these terms in a large version suited for printing. More Information on Creative Commons Licensing of images on this site.